4.5” x .375” crack chaser – Quality: A++ This wheel aggressively cuts a .375” “V” Groove for hogging out cracks in preparation for grouting. 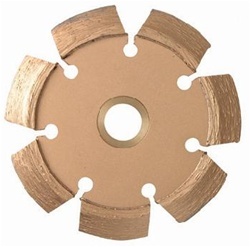 7” x .375” crack chaser – Quality: A++ This wheel aggressively cuts a .375” “V” Groove for hogging out cracks in preparation for grouting. 4” x .250” Crack Chaser – Quality: A++ This wheel aggressively cuts a .250” “V” Groove for hogging out cracks in preparation for grouting. This wheel is used for very hard rock like granite or marble when you don’t want the surface to have small chips. ***Many times an arbor extender is needed to extend the cutting wheel away from the DustBuddie. When the wheel is very close to the collar of the grinder it can rub on the dust shroud and not be centered with the DustBuddie. To extend the cutting wheel out from the collar 1/2 inch, center the cutting wheel and make your tool more maneuverable, we HIGHLY recommend using an arbor extender.